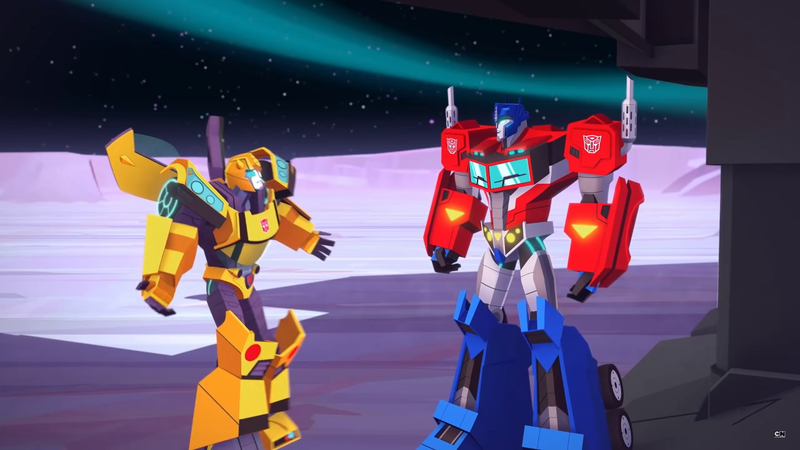 Hasbro have just uploaded episode 3 of Transformers: Cyberverse via their Official YouTube Channel. Previously, Episode 1 “Fractured” and Episode 2 “Memory” were uploaded in HD and English audio. Now, it’s turn of Episode 3 “Allspark”. It is still unknown if more episodes will be uploaded in the future, but you can take the opportunity to watch the first three right now. All episodes are region-free so far. Whoa there! I'm ready to buy 3 seasons of Dr. Smoov Transformers. The entertainment of his work is through the roof. I don't think the 11 minute episodes are working. They really force the pace in a bad way. Eh, I've been watching and loving Netflix's Voltron, and especially with the latest season, I was thinking, this could totally work for Transformers. The brand could really use a series made by the people who made Avatar/Korra, and currently Netflix's Voltron. I think that'd be awesome. Here's a better consideration, make the next Transformers cartoon ran by people that worked on a Number of DC Cartoons instead. The only issue I have with Cyberverse so far is that it hasn't really done anything unique. Just kinda reiterated stuff and lore that's already been established; but then this is Ep 3. It still has a lot of time to do something unique with its' plot. Depends on who you ask – there are people who think it actually was one of the best and there are people who think it's the worst thing we'd gotten since Energon. There really isn't a middle ground. Here's your middle ground: it was a watchable, competently written show which was ultimately too earnest and unoriginal to really shine. In terms of comparing these shows, the order matters. Part of the reason Prime was a bit bland and Cyberverse is super, super bland is because these are all story beats we've seen before at this stage. If Prime had preceded Animated and the movies, though, it would probably be credited with a lot of great ideas. Honestly, at this stage I never want to hear about the Allspark ever again, Megatron is about as convincingly threatening as a lamp post, and I can barely remember why Bumblebee was my favourite character growing up. To the people who think Animated was the last legit good TF show and the others that came after it are beyond horrible or at least flawed beyond belief, Animated itself didn't always get everything right either. Same goes for Beast Wars. They're well written shows true but they weren't also above criticisms and had their share of flaws so putting them that high on the pedestal I feel is doing more harm then good because it's going to lead into people getting their expectations so high to the point of being let down every time it does something people don't like. I feel it's both unfair to both the new shows who are trying to do their own thing and to the people who just want to enjoy the series without needless drama. Which is why that even though there are things I'm not a fan of in Cyberverse I'm not gonna be that guy that mindlessly rips it a new one for not being what I think needs to be a quality series like how I didn't want to be that guy that ripped RID15 a new one because it didn't carry on the things that I dig about TFP especially since Prime itself got ripped a new one beyond belief when it was airing for the flaws it has. I'm willing to see where Cyberverse will go because for all I know it could end up like Animated when it comes to god surprises. @Porkulus Can I sig this please? Every time I read this it’s funnier. Sigh, I just wish they would just bring back Transformers Prime. This is off topic, but I feel like I'm an authority on this for no particular reason. I don't like Prime. It's one of my least-favorite series. I don't like the things they did with some of the characters (particularly Bulkhead and Starscream) and I don't like the same-y narratives the episodes tended to fall into, and I don't like all of the people that worship the show like it's the second coming of Christ, when it shares a lot of the same problems that earlier shows had. I can't say that Prime is a bad show. I really didn't like it, but I don't think it's somehow worse than some other shows. There are a lot of ways that Prime is better than Cybertron, a show I really really like. Prime did a lot of things well, and that's enough to put it ahead of a lot of Transformers shows (because, if we're being honest, quite a few of them aren't that good). Of the shows I've seen, I'd rank Prime somewhere in the middle. TL;DR: I don't like Prime, but I wouldn't call it bad, just divisive. So far this is the worst voice for Optimus and Megatron I agree when somebody said it sounds like they are overdoing it. Hopefully the actors can later Adjust to the roles, I am extremely disappointed that it will likely be a few years until the show gets its next proper reboot. I did not think I would enjoy rescue bots but I did, I hope it will be the same with this series as well. But the opening has not given me a high hopes this is not my attempt to bash the show I want to like the show. And I think people should try to fight less on this issue it is OK to state your opinion without putting down somebody else’s that happens too much on this site. The whole "it's just a show made for kids" thing does t work when in my original comment I mentions shows such as adventure time and gravity falls which are also kids shows but I can happily say I watched adventure time regularly from it's early series and can happily say I enjoyed it as much as I enjoy shows Like; game of thrones, altered carbon, the x files, doctor who and other quality programs. Whereas these recent transormers shows are literally created to the tune of "kids are stupid and they'll enjoy anything"
Maybe they just watched lots of star wars and concluded that villains sounded good with "British" accents, not realising that the concept of a British accent is about as meaningless as the concept of a European accent. To be fair, the bar for god awful British accents in the franchise is set to a near impossible low to hit with today's…well anything. i know i expressed interest in a TF series from this studio as well, and while there are plenty of studios that could absolutly make a quality TF series, possibly better, the idea of a TF series from the cookie cutter mold of Avatar/Korra/Voltron also sounds very enticing for its own reasons. Yes, their three shows so far are basically identical and a Transformers from them wouldn't be much different, but is that a bad thing? if Voltron is anything to go by it would still be GOOD and definitely better than the last few shows depending on who you ask. That might actually be one of the draws, as we would know exactly what kind of series we would be getting if it was done by Studio Mir rather than someone else where tone and things can vary widely. If it's more than wishful thinking, yes. It's unoriginal and panders solely to that group of people rather than an entire audience who can enjoy it for what it is. Believe or not, there are adults (and kids!) who enjoy shows like Cyberverse. People have different tastes. Is that a bad thing? You're like the 12th person to say that exact thing. This 'gold' standard folks have for all-ages animation is beginning to sound like a hive mind mentality. It's basically folks wanting the same formula as Korra/Avatar/Voltron. Amazing how people can try to compare this to G1 when there was no such thing as an Allspark. On another note, bland is a great word to describe this series. I enjoyed the "Kicker" series better than this. I didn't like the Autobots running why rolling could be a better alternative. The Autobot counterattack seems lazy with the exception of Windblade. They need to do better. More likel a herd than a hive. Besides, South Korea’s Studio Mir has a tiny output, so we can presume they’re probably not gunna take the job. Netflix's Castlevania was produced by Powehouse Animation Studios and Frederator Studios, the latter of which is a domestic studio of lineage producing quality ‘toons for CN and Nickelodeon for decades. Also, Netflix has been pretty good about bringing over Studio Trigger shows, excepting Ninja Slayers and Darling in the Franxx, I think? But, whoever could’ve animated Star Wars: The Clone Wars, and Transformers Prime, and New Transformers: Robots in Disguise? Oh, it’s Japan’s Polygon Pictures who worked with Netflix to produce Knights of Sidonia, Blame! and the Godzilla: Planet of the Monsters, City on the Edge of Battle, and The Planet Eater. I love Tsutomu Nihei but I don’t exactly dig these dudes’ style, so I haven’t seen their Godzilla films. Also, Psycho-Pass and Gargantia of the Verduous Planet were cool, but I think Gen Urobochi is a bit of a mixed bag. Anyway, the point is that instead of antagonizing people for being basic and lacking a more developed interest in animation, you could just help elucidate more interesting things to watch.